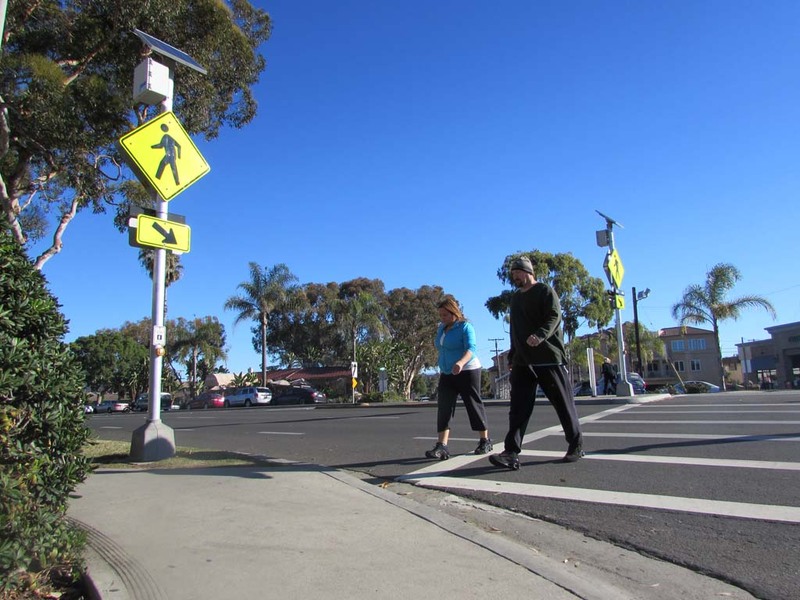 CARLSBAD— City officials are looking at both short and long term plans to make Carlsbad safer for pedestrians and bicyclists. On Jan. 6, the city announced the launch of the Walk + Bike Carlsbad campaign, with partnerships from Circulate San Diego and the San Diego County Bicycle Coalition. The city received a grant from the San Diego Association of Governments as part of their “active transportation” grant, which aims to improve public health and reduce greenhouse gas emissions and traffic. The hope is that more people will opt to walk or bike for trips under a mile, which according to America Walks, makes up nearly half of the trips made by car in the U.S. The city is also taking steps to make the streets safer for pedestrians. Senior Traffic Engineer Doug Bilse said the city is looking into putting more rectangular rapid flashing beacons, like the one on Oak Avenue, along Carlsbad Boulevard. A flashing beacon lights up once a pedestrian pushes a button. It makes the driver aware of pedestrians and increases safety. He said the biggest obstacle to installing more beacons is finding a power source. 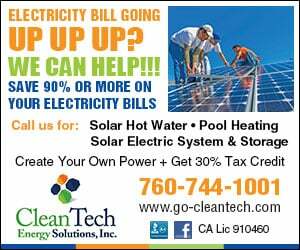 Solar power can be expensive and difficult to maintain so they’ll likely tap into streetlights, according to Bilse. First, city council needs to approve the addition of more beacons. Bilse hopes to begin installing them by summer. “Safety has always been our highest priority, that’s the first thing we look at. So whether it’s a project or a call from a resident, that’s our primary concern,” Bilse said. The roundabout on Carlsbad Boulevard was put in to slow down drivers and increase safety. Bilse hopes to do more projects like that. “Eventually the city will be looking at a whole redesign along the Boulevard,” Bilse added. Some of the possibilities include more lighting, sidewalk and bike lane widening, and maybe even reducing the amount of lanes. The city has already contracted with Florida-based Dover, Kohl & Partners to update the Village’s Master Plan. At a recent Beach Preservation Committee meeting, Senior Planner Scott Donell gave an update on the Master Plan. He said some of the possibilities contractors are considering include the addition of a parking structure near the Carlsbad Village freeway ramp to intercept cars along with a shuttle to take pedestrians into the Village, narrowing some streets to one lane and a complete overhaul of the streets to increase pedestrian use. He said that it may not seem helpful to reduce Carlsbad Village Drive to one lane but it may help in the long run. “The capacity of traffic actually on that street is lower than you might think from a numerical standpoint. When you look at an improvement like this in conjunction with all of the other mobility improvements, you begin to see how this might work,” Donell said. The Master Plan update still needs to go in front of the City Council in April for approval and all of the guidelines won’t likely be realized for years to come, maybe even 10 or 20 years, according to Donell. 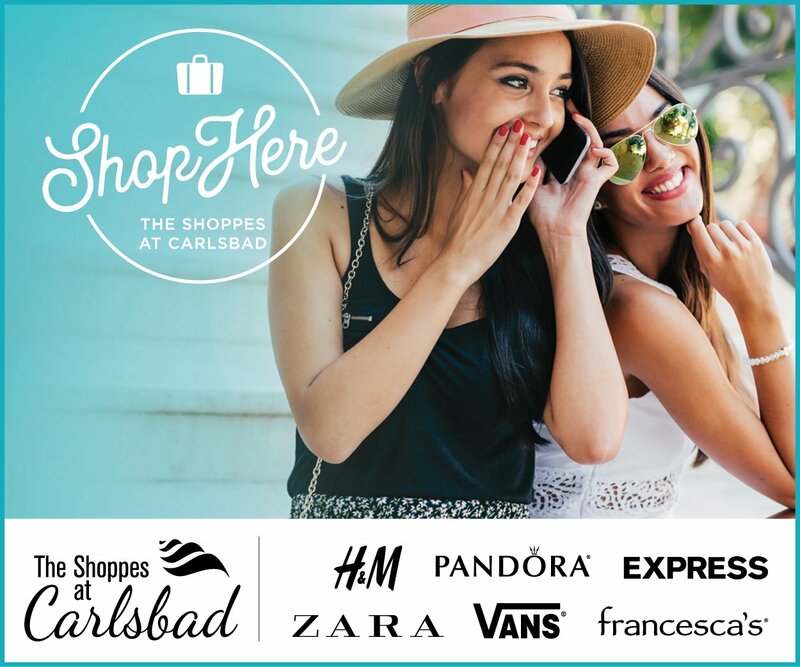 Another area the city plans to focus on is the intersection of Tamarack Avenue and Carlsbad Boulevard. “We’re going to try to tackle a lot of issues there and we’re going to try to get an innovative design to really make it a much more pedestrian friendly area than it is,” Bilse said. A jogger was recently killed near there, although Bilse said, the accident was based on driver error so there was nothing the city could have done to prevent it.